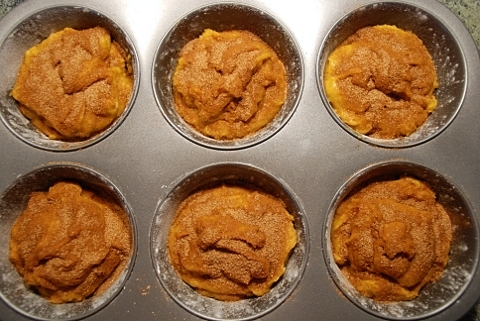 Naturally, then, we had to make pumpkin muffins this fall — as soon as one could reasonably claim it was fall, of course. We merged two recipes that we found from two equally amazing food bloggers, The Pioneer Woman (for the spicing) and Smitten Kitchen (for everything else). These were absolutely delicious for breakfast or dessert — or lunch… or dinner… or midnight snacks… just make them, is what I’m trying to say. You’ve got time; pumpkin season is still on at least through Thanksgiving! Preheat your oven to 350. Either line a muffin tin with liners, or (our preferred way since we don’t have liners) grease the tin, dust with flour, and invert and tap over a sink to get rid of the excess. 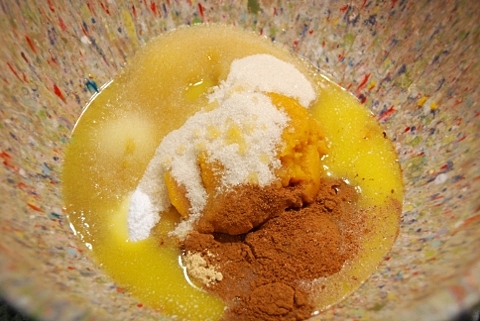 In a small bowl, mix together the flour and baking powder. 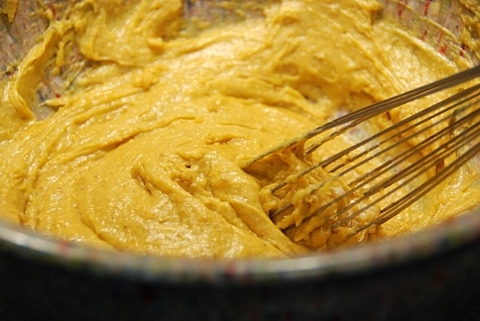 In a large bowl, combine your melted butter with all other ingredients. 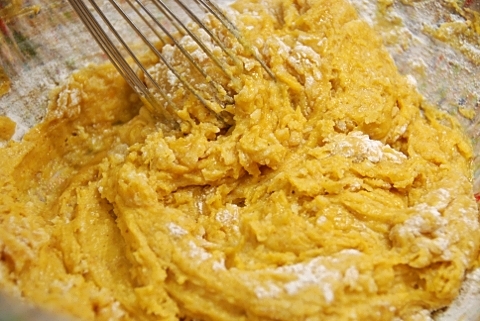 Whisk together until smooth, and then slowly add the flour mixture to this bowl, whisking as you go. Still whisking above… and fully-whisked below. 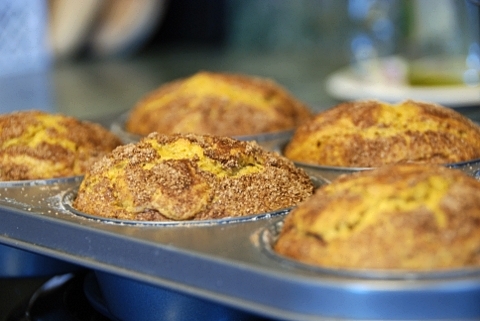 Dole out the muffin batter into your muffin tins. We selected our largest tins (because, I mean, why would you ever go smaller?) and the recipe made about six, but if you go for more reasonably-sized muffins (ha!) you could easily get ten or twelve. Once your batter is divided, mix together the cinnamon and sugar for the topping in a small bowl, and sprinkle a good few pinches of that over each muffin. Be generous. You’ll have some left over. 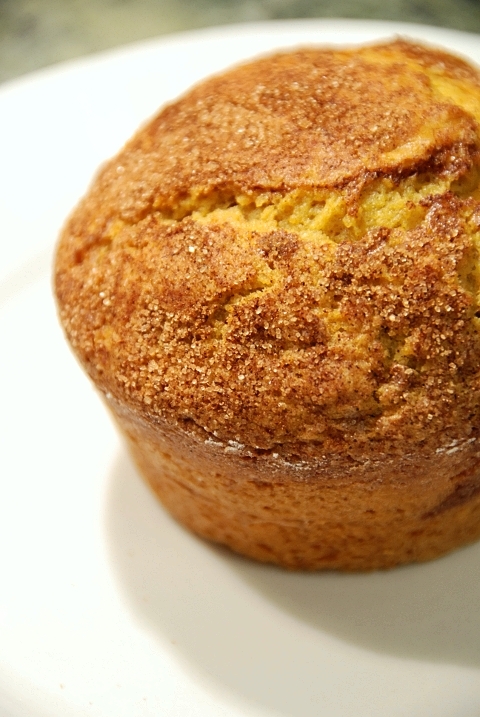 Bake for 25-30 minutes, or until a knife or toothpick inserted into the center of a muffin comes out clean. Check early, since you don’t want to dry out these beauties. Remove from the muffin tin when they’re done, and let cool for as long as you can stand before digging in. We couldn’t wait terribly long. 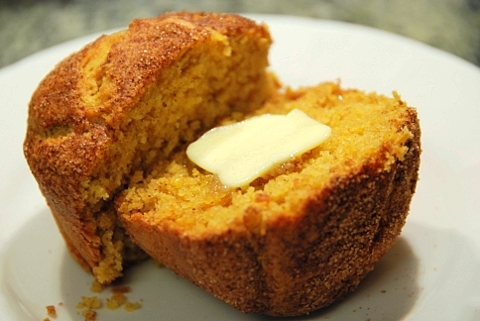 You are currently reading Pumpkin Muffins at Nombudsman.